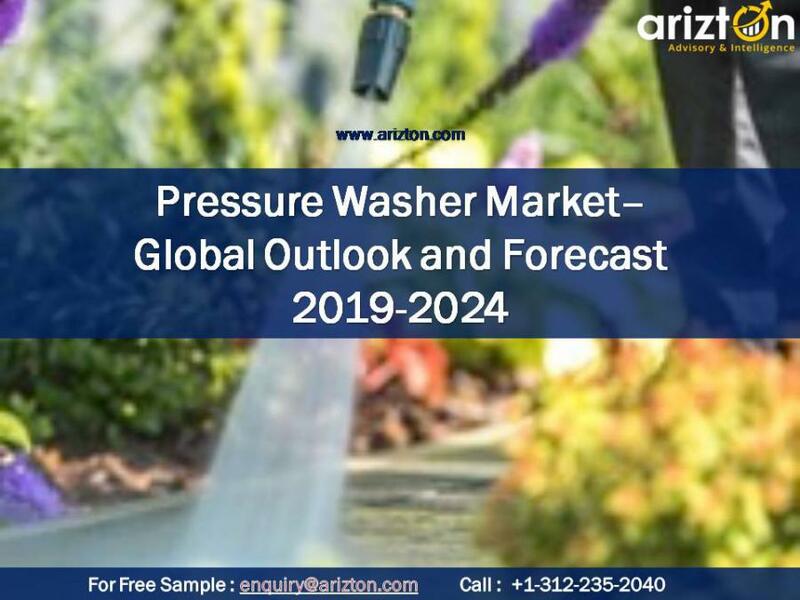 CHICAGO, IL, UNITED STATES, April 10, 2019 /EINPresswire.com/ -- The global pressure washer market is characterized by the presence of several global and regional vendors, which compete based on quality, technology, services, and price. With expanding technological innovations and an increasing number of mergers and acquisitions, the competition is expected to intensify further. Leading vendors are investing in R&D activities to develop customer-centric products with high capacities and long battery life. The market is witnessing advancements in terms of capabilities, versatility, and utility. The market in North America and Europe is comparatively mature and is mainly driven by continuous product innovations by the key players in the market. The global pressure washer market report covers market sizing and forecasting, market shares, industry trends, growth drivers, and vendor profiling. The study includes insights on segmentation by power sources (electric, battery, gas), output types (0-1500 PSI, 1501-3000PSI, 3001-4000 PSI, and 4000+ PSI), end-users (residential, commercial, and contract cleaners), and geographies (Europe, North America, APAC, and Latin America). The report considers the present scenario of the global pressure washer market and its market dynamics for the period 2019−2024. It covers a detailed overview of several market growth enablers, restraints, and trends. The study includes both the demand and supply side of the market. It profiles and examines leading companies and other prominent companies operating in the market. The rise in disposable incomes and the adoption of professional cleaning equipment have positively affected the pressure washer market. With the significant growth in the construction of offices and work-space buildings, the demand for commercial pressure washing services has increased significantly. The pressure washing service industry is increasingly adopting green pressure washing technology, which is environment-friendly with low carbon emissions. The growth in environmental awareness is expected to influence the global pressure washer market growth during the forecast period. Looking for more information? Download a free sample here! This market research report includes a detailed segmentation of the market by power sources, end-users, output types, and geographies. The global pressure washer market by power sources can be categorized into electricity, gas, and battery. The electric pressure washing segment captures more than half of the global pressure washer market, followed by gas and battery power washer segments. A washer with a maximum pressure of around 2500 PSI is generally used for domestic purposes, including cleaning small decks, patios, furniture, and stain removal. The pressure washer market by output can be categorized into 0 to 1500 PSI type, 1501 to 3000 PSI type, 3001 to 4000 PSI type, and 4000 PSI+ type. The 1500 to 3000 PSI type segment dominated more than half of the pressure washer market in 2018 and is expected to grow at a CAGR of around 3% during the forecast period. The pressure washer market consists of three types of end-users - residential, commercial, and contract cleaners. The residential segment accounted for more than one-third of the market in 2018 and is expected to grow at a CAGR of around 3% during the forecast period. The increase in dual-income households and the growth of the aging population are expected to increase the market size of the residential pressure washer market. The global pressure washer market has a worldwide base, including Europe, North America, APAC, Latin America, and MEA. Europe accounted for one-third of the global market in 2018. Growing business investments, increasing commercial and residential construction activities, and rising government spending on infrastructure are major factors for the high market share in Europe. North America is witnessing a high demand for pressure washing systems due to strong growth in the economy, the rise in construction activities, the establishment of new business, the expansion in commercial spaces, and the rise in disposable income. Request a free sample here! The global pressure washer market is highly consolidated, and new players are entering the market to leverage lucrative business opportunities. Leading vendors in the market are focusing on integrating the latest technology with washers. Leading companies are likely to compete in the market in terms of performance, compatibility, reliability, quality, price, and market recognition. •	Briggs & Stratton Corp.
Other prominent vendors are Generac Power Systems, Alkota Cleaning System, Annovi Reverberi Group, Campbell Hausfeld, Deery & Company, Lavorwash Group, Snow Joe+Sun Joe, Stanley Black & Decker, IPC Solutions, Techtronic Industries (TTI), Husqvarna, Koblenz Electrica S.A, Simoniz, Stihl, Hitachi-Koki, AR Blue Clean, Makita, Zhejiang Anlu, Greenworks Tool, Mi-T-M, North Star, Snap-on, Vortexx Pressure Washer, Troy-bilt, Duromax, Ridgid, Yamaha, Delux Cleaning Supply Inc.